Blue Jeans Cable is now America's only vendor of ultrasonically-welded speaker cables; with our recent acquisition of a Sonobond ultrasonic welder (manufactured in West Chester, PA), we are able to weld (yes, that's "weld," not "solder") locking banana plugs, spades and pin connectors to any of our speaker cable products. Ultrasonic welding allows us to literally fuse the copper wire to the brass banana plug body without using the heat of conventional gas or arc welding, for a tremendously strong physical connection, low contact resistance, and low susceptibility to corrosion. To read more about this unique process, see our article: Ultrasonic Welding at BJC. Our favorite speaker cable is the Belden 5000 series; we carry two offerings, the 10-gauge 5T00UP and the 12-gauge 5000UE (note: with wire gauges, the smaller the number, the larger the wire is). 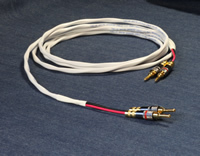 Belden's standard version of these cables is available only in a gray jacket, with white and black inner conductors; however, we've had Belden build us a slightly modified version of each, with a white outer jacket (less conspicuous in many installations) and red and black inner conductors, which we call "Ten White" and "Twelve White". Both the 10-gauge and 12-gauge versions consist of two separately insulated conductors, twisted together and wrapped in an outer PVC sleeve; the gray version of the 10-gauge 5T00UP is shown at right. 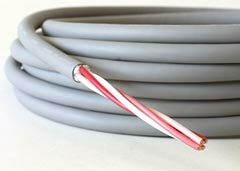 Whether in white or gray, or 10 or 12 AWG, all of these cables are UL-listed and NEC-rated for in-wall use (the NEC rating for 5000UE and Twelve White is CL3R; for 5T00UP it's CL3, and for Ten White, it's CL2). Canare 4S11 is a "star quad" 14-gauge cable, with four conductors together in one outer jacket; it is popular for bi-wiring (where separate wires run to each of four speaker terminals, two of which drive the high and two of which drive the low-frequency elements of the speaker assembly). When conventionally wired, star quad speaker cable has the advantage of reducing the EM field around the cable, which will tend to diminish the effect of the signal in the speaker cable upon nearby interconnects--though this is not, in most applications, a significant concern. 4S11 is a very pleasant-looking cable, with a round matte gray jacket, and is quite large--about 3/8 inch in diameter. 4S11 is not UL-listed or NEC rated. We offer this cable raw, and terminated either in single-wired or bi-wired configurations. 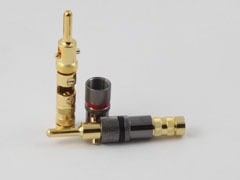 Our ultrasonically-welded terminations include locking banana plugs (same appearance as pictured below, but without the internal setscrew arches), and three different types of spades and a "pin" connector which are pictured to the right. 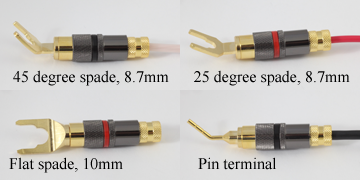 The pin connector, designed for use with wire-clip type terminals, presents some special issues and cannot be ordered on this page but can be ordered here: Speaker Cables with Pin Connectors. The spades will fit most types of binding posts. Our spades are available in three configurations: the opening of our standard 45 degree spade is about 8.7mm wide at its widest and will fit the vast majority of binding posts (up to approx. 5/16 inch or smaller); our 25 degree spade is the same width as the 45; and our flat spade's opening is 10mm wide and so will fit unusually-large diameter binding posts up to 3/8 inch. All three types of spades have, as you can see most clearly on the picture of the flat spade, a smaller round indent at the back of the opening, and all of these round indents are about 1/4 inch wide. Forks Versus Spades: Binding Posts or Terminal Strips? 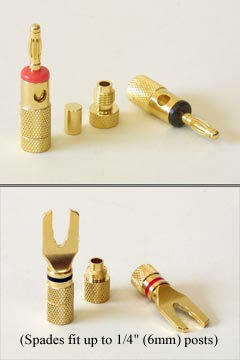 The welded spade lugs depicted above are made to fit conventional binding-post terminals such as are typically found on speakers. The opening of the spade lug is large (8.7 to 10mm), which will fit these posts. 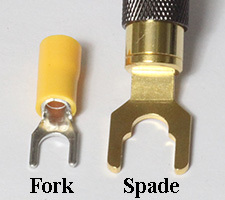 If, however, you need connectors to fit terminal strips, such as are found on some amplifiers, these spades are much too large. For these applications we offer small soldered-on fork terminals which are intended to fit these terminal strips -- we have these in #6 (.138 inch, 3.5 mm), #8 (.164 inch, 4.17 mm) or #10 (.19 inch, 4.83 mm) size; all of these measurements are of the INSIDE of the fork; you should measure the terminal diameters on your terminal strip to verify these will fit before ordering. The important attributes of a banana plug or spade lug are its ability to be reasonably well tightened onto the cable and its noncorrosive coating--the job of a banana or spade is very simple otherwise, as all it needs to do is provide a mechanically stable connection to the binding post and to the speaker wire. We carry banana and spade lugs which we import directly from a supplier in Taiwan; these are gold-plated and are of a compression screw termination type--that is, one inserts the wire through the rear portion of the connector, flares the wire to make it overlap the end of that rear portion, and then screws the front portion of the banana or spade onto the threads (see our speaker cable termination instruction page). Properly done, these terminations are extremely solid and can't be removed even with very strong pulling. Because these plugs have a conductive metal surface on their entire exterior, we recommend using a bit of heatshrink tubing (included with the connectors) to provide an insulating layer which will help protect against the possibility of shorting one connector to the other. Bear in mind, when choosing between spades or bananas, that because spade lugs have to go onto binding posts sideways, they really aren't practical for many of the surround amps on the market today, as there just isn't room for them. If in doubt, you're better off with banana plugs, which plug right into the ends of most binding posts. We also offer a locking banana plug; this plug, shown at right, has a tightening collar which can be used to expand the width of the banana after insertion, for an especially secure installation. The speaker wire is fed into the rear of the plug, and the wire is then clamped in place with a pair of brass setscrews. As with our standard bananas, instructions for terminating these are contained on our speaker cable termination instruction page. We offer all of the speaker wire above in raw lengths, and we offer the banana and spade terminals in pairs. Terminating these yourself is easy to do, and instructions for termination are contained on our speaker cable termination instruction page. Alternatively, we also can terminate your cables for you here; our terminated speaker cables use the locking banana plugs shown above and/or the compression-style spade lugs, as you specify. you'll need two pair per cable. Click here to read more on this process, available exclusively from BJC. Also Note: Pin Terminals are not shown below but are available at this page. NOTE: Price shown is for one two-conductor cable, which will hook up one speaker. If Pin Terminals are needed, click here for more info and to order. NOTE: Price shown is for one four-conductor cable, which will hook up one speaker. for bi-wiring or bi-amping select four connectors for one or both ends as appropriate.